I first visited Thailand in 2009; it was the first stop in a round-the-world backpacking trip after university. It opened my eyes to a completely different culture, nothing I’d ever experienced before. I loved it so much, I went back to explore more of its wonders over new year this year. If the country’s stunning beaches and incredibly hospitable people aren’t enough to warrant a visit, then combine those things with its amazing (and very cheap) food and you’d be a fool to miss out. 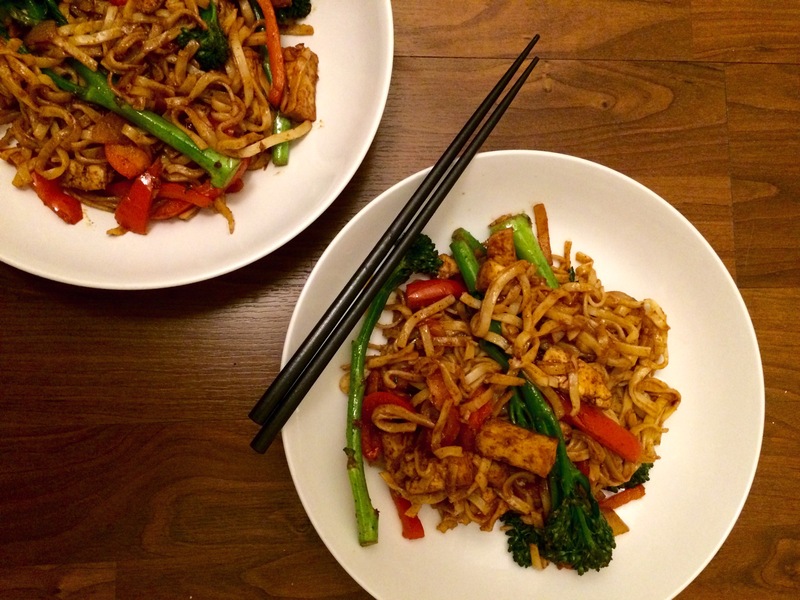 Pad thai to Thai people is like a roast dinner to us Brits. It’s a staple dish and is sold almost everywhere. And it’s delicious in all its varieties. Traditionally it’s served with shrimps, but restaurants are always happy to make a vegetarian version with tofu if you ask. 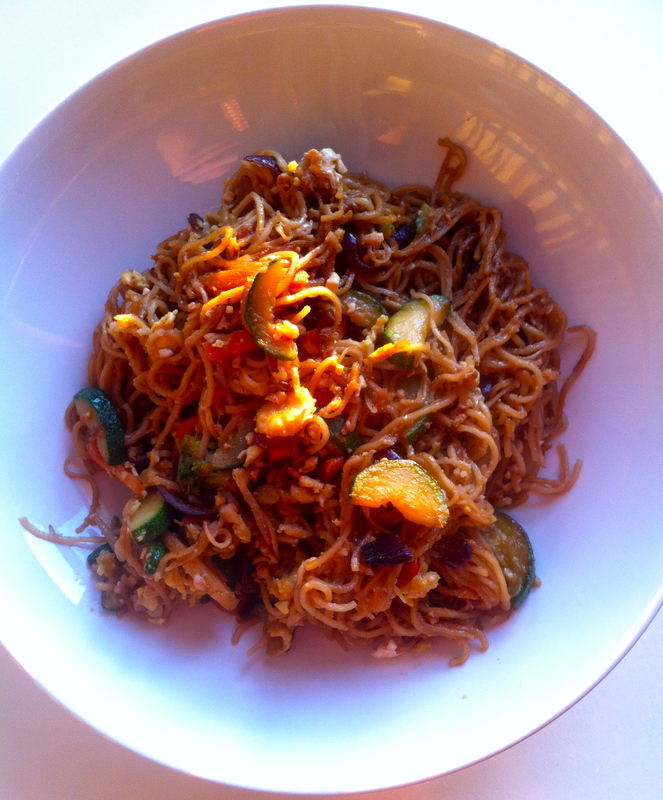 This version I make is a sexed up stir fry. A cheat’s pad thai. It’s very quick and simple to make. It’s an adaptation of a traditional pad thai I saw on BBC Good Food combined with a sauce based on a recipe from one of my favourite vegetarian cookbooks at the moment, Leon Fast. Firstly, pop your block of tofu on to a large plate. Put a chopping board on top of the tofu and balance a heavy frying pan on top. Leave this for 15 minutes or so to drain out as much water as possible. The firmer the tofu, the better. Put a large frying pan on a medium to high heat and drizzle the olive oil all over the pan. When the oil is hot enough to move around the pan freely when you lift it up, add the onion and fry for five minutes, until soft. Meanwhile, half-fill a saucepan with cold water and bring it to the boil. Add the stir fry vegetables to the water. When the tofu is firm enough, chop it up into 5cm cubes. When the onion is cooked, add the tofu and cook for five minutes, stirring occasionally. Next, add the two portions of noodles to the saucepan with the vegetables and boil for 2-3 minutes. While everything else is cooking, combine all of the sauce ingredients in a tall-sided bowl and whiz them together with a hand blender, being careful not to let the liquid splurt out of the bowl (and go all over you, which has happened to me before). When you’ve smoothed out most of the peanuts in the peanut butter and the mixture is runny, give it a quick mix with a spoon and leave it to stand. Add the courgette to the frying pan with a dash of soy sauce and stir it in with the onion and tofu. Drain the stir vegetables and noodles with a colander and shake the excess water over the saucepan so you don’t lose any valuable noodles. When the courgette pieces are soft, add the noodles and vegetables to the frying pan, mixing all of the ingredients in well with each other. Do this for five minutes or so, or until everything is well mixed. Pour the sauce over the mixture in the frying pan and stir in until it coats everything. Lower the temperature to a low to medium heat, and using a wooden spatula or spoon, squash all of the mixture to one half of the pan. Pour the egg into the other half of the pan and mix it constantly until it has a runny, scrambled consistency. Mix the egg in thoroughly with the rest of the pad thai and season with salt and pepper. Serve in bowls, with a slice of lime and crushed peanuts on the side if you’re feeling fancy. And that’s how you make a speedy pad thai.